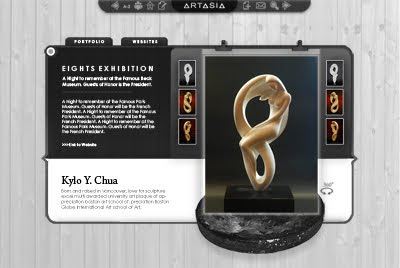 While the team is still focusing on the design aesthetics portion of constructing the online 360 view gallery for sculpture, I'm already pondering on what makes up the optimal level of efficiency for showcasing fine art through internet exhibitions. Today, I've seen several prime websites featuring both art and luxury wares that seem to create a community that encapsulates the public in terms of interaction, revisits and overall design impact. Art.com is a good example, however 3D capabilities aren't much needed for prints and paintings. They possess a framing program that allows you to see your online purchases in different 2D frames just in case you'd like to avail of one. The site framework works very well with their target audience and buyers. Another good practice can be seen by Amara.co.uk, with their simple and attractive layout design that highlights their products and brands in a minimalistic class of elegance. For years, web designers, brand owner and gallery owners alike have been searching for a great balance in the elements of an online gallery. Whether it be for show or for pre-selling, design ought to go hand in hand with back-end programs and user interface efficiency for the entire objective to be prioritized: Attracting a serious audience and keeping them interested in what you do or what you have to show. This is a crop from the per-piece rotational window design I created. I'm currently assessing its usability features and brainstorming with my team on how to best create a gateway for viewers to openly share in the art culture on the site. We may have some changes, big and small. In the end though, we all believe that this project could change the way people view online sculpture exhibitions as a whole.